Update: So we might've let the cat out of the bag a little early on this one, but Roku and HBO have announced today that they plan on bringing the contract-free streaming service, HBO Now, to all Roku U.S. devices - including the Roku 4 - when it launches later this month. HBO will offer a 30-day free trial for new users then charge $15 per month for the service. Pro tip: If you have a streaming device to release this fall, now would be a good time to throw your hat in the ring. It's starting to get a little crowded. Major hardware updates to the system include an optical audio out port, an 802.11ac WiFi antenna and a beefier quad-core processor, all of which will be housed in a flat, elongated puck. 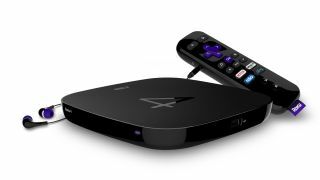 So what will set the Roku 4 apart from the competition? Like its predecessors it will come with a remote - a missing component of the brand-new Chromecast 2 - and though we weren't told it explicitly, will most likely come with a built-in microphone for voice search. It supports 4K, unlike the new Apple TV, and isn't tethered to one ecosystem like the revamped Amazon Fire TV. Roku also baked in a new feature for habitual remote displacers: a button on the back of the box called "Find Me" that causes the remote to play a tone from wherever it is in the room. A PR representative from Roku says the tone will change based on which theme is currently running on your Roku (and yes, there will be a Star Trek theme with the door-opening sound effect in case you were wondering). On the software side of things, the system will run on an updated version of Roku OS. The latest version will raise up the UI to 1080p and introduce TV shows, directors and actors into the My Feed content-tracking feature that was introduced in the last big update. Roku's new 4K over-the-top streaming box won't leave you high and dry when it comes to content, either. As soon as the software rolls out to the new device, Roku says that you can expect to find a 4K UHD section of the channel store, as well as a tab on the homepage dedicated to Ultra HD movies. The new Roku 4 will face some steep competition from Apple, Google and Amazon this fall, but the tenets that made the Roku 3 one of our favorite streaming systems remain alive and well in its fourth iteration. It looks just as fast if not faster than the competition, offers a wider app selection (Roku OS currently has over 3,000 "channels" of content) and remains one of the few ecosystem-free streaming options that offers Netflix, Amazon, HBO Now and Sling TV full stop. The Roku 4 is available starting today for pre-order on Roku's website and most US retailers, and is expected by to hit stores and mailboxes by the end of the month. In the UK though there has been no announcement as to when we might expect the new 4K Roku 4 to land there. Which streaming system is the best right now? Read our New Apple TV vs Chromecast vs Roku 3 vs Amazon Fire TV field guide to find out.